The Mariners are well aware of their ignominious distinction as owners of the longest current playoff drought in baseball. It's been 17 years since Seattle -- which set a record with 116 victories in 2001 but was bounced by the Yankees in the ALCS -- last played a game beyond No. 162. Early indications this offseason are that fans of the franchise could be waiting a while longer as general manager Jerry Dipoto has begun a roster overhaul that includes dispatching ace left-hander James Paxton to the Yankees, closer Edwin Diaz and second baseman Robinson Cano to the Mets, shortstop Jean Segura to the Phillies and catcher Mike Zunino to the Rays. Dipoto's deals have reshuffled the top of the Mariners' prospect rankings, which are headlined by newly acquired left-hander Justus Sheffield, outfielder Jarred Kelenic and righty Justin Dunn . These players, along with emerging talent already in the system, could rise quickly and be called upon to help the big club sooner rather than later. "I know we're headed in the right direction," said Tom Allison, the team's vice president of scouting. "We're creating players who have value, whether that's value for the Major League team, whether that's value in the Minors or whether it's value as a trade piece. That's the one thing we talk about in scouting and developing players. "With [director of player development] Andy McKay and his staff, [director of international amateur scouting] Frankie Thon and his staff, we know we're going to put a process in place. [The player] will tell us how much they'll impact the team, how quickly they move and where they end up." Catcher -- Cal Raleigh, Everett (38 games): The Mariners' third-round pick in June acquitted himself quite well as a pro, batting .288/.367/.534 for Class A Short Season Everett. A switch-hitter, Raleigh signed for a reported $854,000, well above the $632,700 slot value. Scouts tout the M's No. 18 prospect as a potentially dynamic hitter with raw power, especially after a breakout junior season at Florida State in which he hit .326 with 13 homers and 54 RBIs. "[Area scout] Rob Mummau did a great job of reminding us what he was doing, what kind of guy he was, his makeup," Allison said. "Once he got into our system, we saw what kind of guy he was and the effect he has, not just on games but on people. He makes the rest of the players better." Everett hitting coach Eric Farris told MiLB.com in July, "this kid's a monster," and Allison agrees. "We really believed in the bat and we believed in parts of the catching," he said. "You never really know what kind of game-caller a guy is … but he took so many strides with our [player development] staff -- running the game, framing, throwing. And he's just so humble and willing to get better." First baseman -- Evan White, Modesto (120 games), Tacoma (four games): The Mariners were keenly aware of White's prowess with the glove when they drafted him in the first round in 2017. While at the University of Kentucky, he was projected by scouts as a 70 fielder on the 20-80 scale and drew comparisons to the Dodgers' Cody Bellinger. They also liked his smooth right-handed swing and were willing to gamble that the power projected for a corner infielder would come. It did, in the second half of 2018. After working with Nuts hitting coach Joe Thurston, White lowered his hands to try to generate more bat speed and power. "I think it was early- or mid-July when I realized my hands were firing from too steep a position," he told MiLB.com in late August. "I got to work on lowering them a little bit and I finally found a spot that I'm comfortable with. There were some bumps as I worked through it, and it felt like it was a process for the whole month. But it finally got to a point with all the cage work and game work where I got my hands in the right position to fire." The Mariners' No. 5 prospect clubbed eight of his 11 homers after the All-Star break and slugged .512 in the second half, including .703 in August, when he launched five long balls. That got the attention of the Mariners front office. "Watching him and his athleticism and seeing him make adjustments, time after time," Allison said when asked what impressed him most. "He can carry a high average, but [then] he started impacting the ball like he did in August and more in the [Arizona] Fall League. And it's really balanced by his defense, which is special." Second baseman -- Donnie Walton , Modesto (57 games), Arkansas (62 games): The classic son-of-a-coach ballplayer, Walton doesn't possess above-average tools but has a high baseball IQ and a knack for finding himself in the right spot. He hit .273/.365/.381 between Class A Advanced and Double-A and even when he struggled at Arkansas, he still managed to keep a sharp eye at the plate and draw walks. On defense, the M's 22-ranked prospect has solid mechanics and a good enough arm to play shortstop, if needed. "He's been around the game his whole life," Allison said. "He's a yard rat, he has the high baseball IQ and a contact-oriented bat. He's a selfless player." Third baseman -- Seth Mejias-Brean, Arkansas (33 games), Tacoma (96 games): A 2012 eighth-round pick by the Reds out of the University of Arizona, Mejias-Breen -- like Walton -- is more about the sum of his parts than any one tool. This year, he showed his typical knowledge of the strike zone and ability to grind at-bats and had his most consistent season since 2014. He solidified third base for the Rainiers after his promotion and showed off his plus throwing arm and solid defensive mechanics. A free agent after the season, it's unclear whether Mejias-Brean will return to the organization, although Allison appreciated his effort. "He comes from a great baseball background, the [University of Arizona]," Allison said. "They all know how to play. But the pure physicality he has … he's able to do things with a little more impact and he's really solid on defense." Shortstop -- Bryson Brigman, Modesto (98 games): The Mariners traded Brigman to Miami at the July non-waiver Trade Deadline for outfielder Cameron Maybin. But before the deal, Brigman was having his best offensive season as a pro, including slashing.405/.485/.595 in April. "One of the biggest things is just trusting himself again," Modesto hitting coach Joe Thurston told MiLB.com in July. "He did a really good job of just going out there, having fun, competing and doing whatever he could to have good at-bats and let the results take care of themselves. Obviously, he was hitting really well early on and the numbers were really high, and I think it was one of those things where you kind of start to chase that. You start chasing your average and you start chasing the results ... and wanting and thinking that I'm going to put everything in play and I'm going to get a hit." The 2016 third-round pick out of the University of San Diego might end up being more of a utility player because of his arm, but he manned shortstop effectively in both the Mariners and Marlins systems. "He's another guy who really did all he could to get better," Allison said. "A lot of that is attributed to spending the winter in Arizona and saying, 'I'm going to get myself in great shape so I can make an impact.' His swing was adjusted and he made himself better in the field." Keegan McGovern , Everett (four games), Clinton (65 games): A ninth-round pick from the University of Georgia in June, the left-handed hitter made a quick impact as a pro, blasting 15 homers with Class A Clinton after a pitstop at Everett. A four-year starter with the Bulldogs, McGovern was a first-team all-Southeastern Conference pick after putting up a .324/.442/.627 slash line and showing off his above-average power with 14 homers. "So much credit goes to the area scout, John Wiedenbauer," Allison said. "He had a gut feel and said, 'We've got to have this guy. He's a really good baseball player.' And John stood with that, kept telling us, 'This is a good, good player.' He jumped from hardly any ABs in Everett to [Class A]. He hits the ball really hard. He's so physical and he knows the game plan." Chuck Taylor, Arkansas (126 games): It's hard to imagine the man they called "Chucky T" was a high school quarterback -- given he's listed at 5-foot-9, 190 pounds -- but indeed he did at Mansfield Timberview High in Texas. Now Seattle's No. 27 prospect, he's known for his plus speed but has not utilized it much, stealing 56 bases across seven pro seasons. The Mariners selected Taylor from Arizona in the Minor League portion of the Rule 5 Draft in December and assigned him to Double-A. He's a gap-to-gap hitter who grinds at-bats and picked up the pace after hitting .247 in April, finishing at .297 with a career-high 60 RBIs. "He's definitely outgrown the quarterback position now," Allison said. "He sprays the ball around and he got off to sluggish start, but then he really started carrying that team." Jack Larsen, Clinton (88 games), Modesto (26 games): Despite a standout career at UC San Diego, where he ended up as the career leader in walks and among the leaders in homers and RBIs, Larsen was not drafted in 2017 and signed with the M's as a free agent. He's rewarded them, especially this year at Class A Clinton, where he slugged 14 homers and had a .384 on-base percentage. "He had the benefit of having [Jerry Dipoto] go down and see that [UCSD] team because his son is on the team," Allison said. "But he's a guy who did things quietly, which is probably why he didn't get drafted. But we saw the athleticism, and he got an opportunity in [the Arizona League in 2017]. And he and [Ryan Costello] carried that team. "Watching him this year, he's got a chance to be a [big leaguer]. When you're older and non-drafted, you have to come out and perform, and that's what he did." Utility player -- Joey Curletta, Arkansas (129 games): A 2012 sixth-round pick of the Dodgers, Curletta displayed the kind of power in 2018 that had been forecasted for him since he was a prep star at Mountain Pointe High in Phoenix. The 6-foot-4, 245-pounder was named Texas League Player of the Year after setting career highs with 23 homers and 94 RBIs. A two-way star in high school who threw as hard as 94 mph as a pitcher, Curletta has been compared to Mark Trumbo for his raw power. He said the key to unlocking his power was talking with old high school buddy Scott Kingery. The message: let the natural strength of his frame take over. 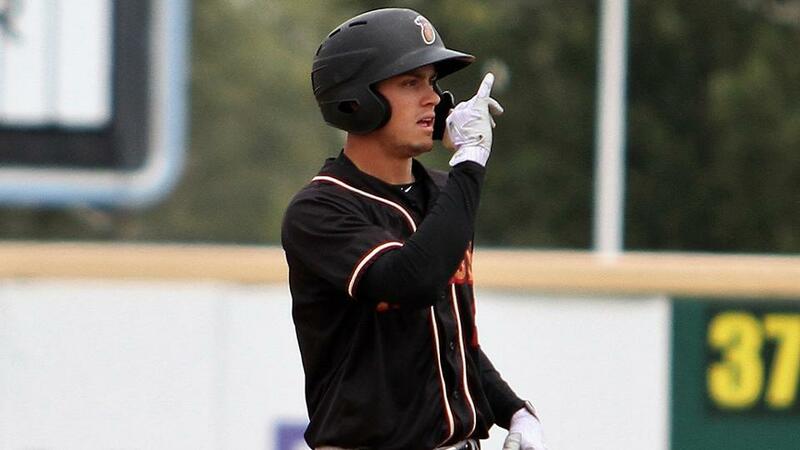 "He told me what [Kingery and Aaron Judge] did when they were together, and I just grabbed a few of those things," Curletta told MiLB.com in August. "And I tried the best I could to implement it." Still 24, the Mariners recently added the lefty slugger to the 40-man roster to protect him from the Rule 5 Draft. He played first base exclusively this year but has extensive outfield experience. Right-handed starter -- Darren McCaughan, Modesto (25 starts), Tacoma (two starts): McCaughan was a top college performer at Long Beach State, going 23-5 with a 2.30 ERA and being named to multiple Division I All-America teams. Despite his track record of success, the 6-foot-1 righty was more about results than raw stuff and he fell to the 12th round of the 2017 Draft, where the Mariners happily scooped him up. In just his second pro season, McCaughan reached Triple-A after putting together a 6-10 mark with a 3.05 ERA and six homers allowed in 138 2/3 innings. "We were actually in Stockton and [manager] Mitch [Canham] called me into his office and told me what was happening," McCaughan told MiLB.com about his brief stay at Tacoma. "Next thing you know, I had to go up there. It was a big thing not really making it -- obviously, it's a big deal -- but not really making it bigger than it is. It's still baseball. Well-executed pitches get guys out no matter where you're at. I just wanted to go into it with that mentality, but it was great. It was great going up there, great atmosphere. At the end of the day, it's still baseball. Just go up there and have fun." The Southern California native throws four pitches but mostly works with a high-80s fastball and changeup, relying on command and deception to throw off opponents. "Probably because his velocity fell off from his Team USA [stint], whatever that means in the world of being successful," Allison said of McCaughan falling in the Draft. "He knew his weapons, knew how to change speeds and is an unbelievable competitor. Even when we sent him to Triple-A for a time ... the guy just doesn't get overwhelmed." Left-handed starter - Orlando Razo, Everett (15 starts), Modesto (one start), Clinton (one start): A 2017 16th-round pick out of UC-Davis, Razo impressed the Mariners during his redshirt junior season, when he was twice named Big West Pitcher of the Week and struck out a school-record 13 in a seven-inning one-hitter. Not overpowering, the 5-foot-11 southpaw relies on command and changing speeds. He finished 2018 with a 3.17 ERA and 73 strikeouts over 88 innings. "He's a kid from UC Davis and was a quality starter for them, but probably last year had too many innings under his belt," Allison said. "He spent all of 2017 and extended spring getting himself ready and that really showed when he got up there. He's willing to be the staff ace and it came through. He's fun to watch, got a nice changeup, really nice breaking ball and he's good in the zone." Relief pitcher -- Matt Festa, Arkansas (44 games), Seattle (eight games): The Staten Island native was a starter at East Stroudsburg University, where he blossomed into one of the top pitchers in Division II as a senior, going 11-2 with a 2.35 ERA. He moved to the bullpen in 2017 and broke out, striking out 99 while walking 19 over 69 2/3 innings. A 6-foot-2 right-hander, the M's No. 12 prospect pairs a mid-90s fastball with a late-breaking slider that translated to a successful stint with Seattle in 2018. "He obviously was a successful college starter," Allison said. "He matched up with a guy we drafted the same year [sixth-round pick Brandon Miller] and pitched really well. When he came out to our workout, now you get to be around the player and you find he's an extreme competitor. He's made strides to just keep getting better and he got a taste of the big leagues. He was an integral part of that [Double-A] Arkansas team."